FINALLY, we escaped from Puerto Don Juan and its wind. Holy smokes! 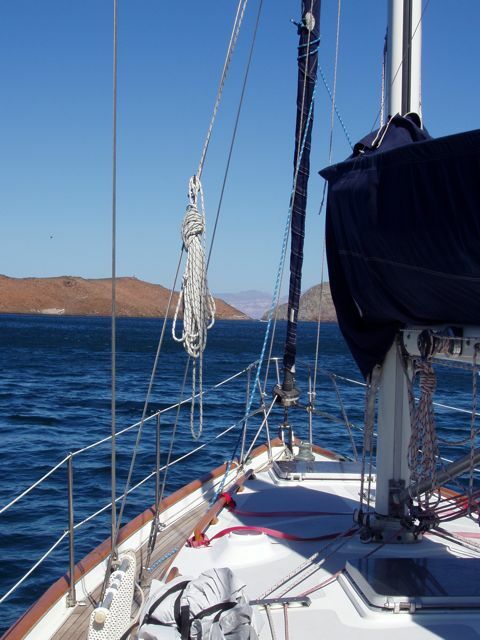 We motor-sailed to Bahia San Francisquito, a short 28 nm trip and enjoyed a short but lovely evening there. 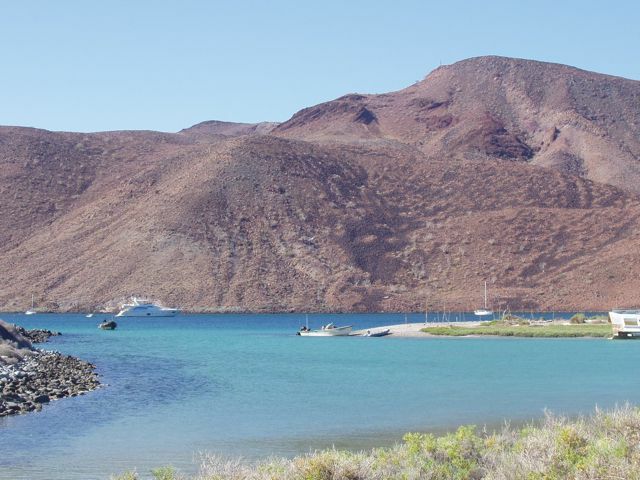 We arose early (see the blog) and motor-sailed to Santa Rosalia, a town on the Baja coast that we visited last leg. This is the town with the church designed by Gustav Eiffel. We set our sights on seeing the museum and the old French cemetery. Those imperialist dog French would not be caught dead with the Mexicans and Yaqui Indian prisoners who worked the mines. 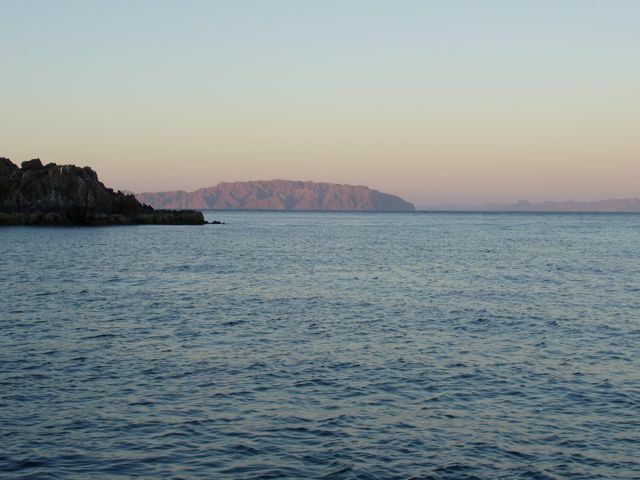 This set of photos include some from as far back as Isla Partida, a small dog-bone-shaped island that offered shelter to us on our way across the Sea. Hard to imagine that we've traveled so far and for so many days without setting foot on land. 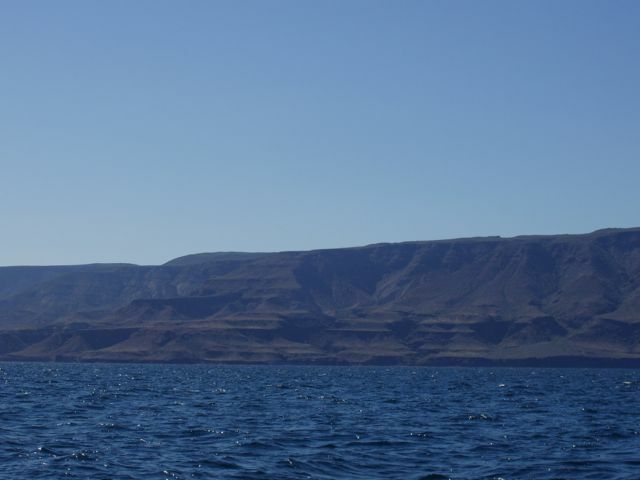 All of the Sea of Cortez is volcanic, and nothing shows this more than the amazing shapes of basalt that form these columnar shapes here. 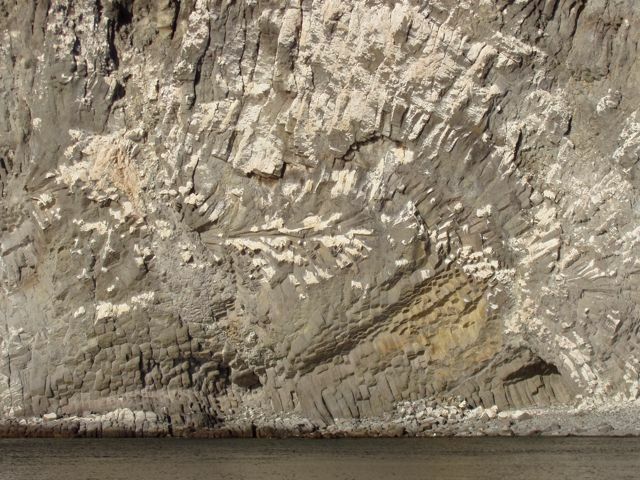 Of course, bird doodoo helps delineate the shapes: what geology lovers! Isla Partida, south side. Wings at anchor in Puerto Don Juan. We launched the dinghy and motored to the "Bathtub Bar", as it's known, to see things and leave the boat for the first time in a week. 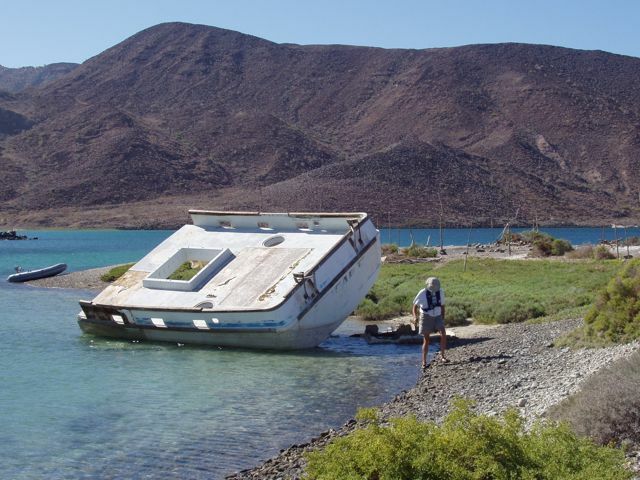 The winds in Puerto Don Juan destroyed this boat long ago. The other half was in the next little bight in Puerto Don Juan. It got our attention! Conni steps carefully on the slimy surface. Behind here are the remnants of a camp, probably erected by locals for tourists. The Super Yacht, Mercedes, an 85-ft Azimut at left, starts the list of vessels with whom we endured the wind storm. Behind her is a very small sailboat that weathered the storm easily. Wings is at right. In the foreground are two fishing boats with crews cleaning their night's catch of rays. Our small dinghy is just to right of their two boats. I hated wading through all the blood to return to Wings! We don't keep souvenirs anymore, but we do collect and photograph cool stuff that we find. 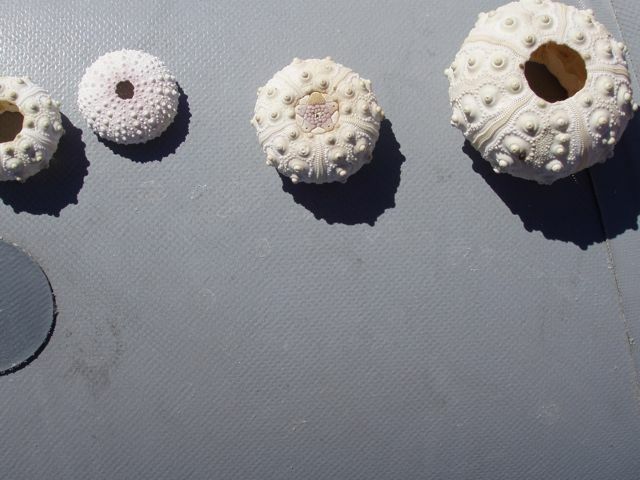 This a series of sea anemone shells that we found on the Bathtub Bar. The one in middle is the only that we've ever found that had the filter or "mouth" intact. On Wings, looking toward the entrance to Puerto Don Juan. Our first anchorage in the bay was where the white patch is on the far shore. Poor holding drove us off after a sleepless night. 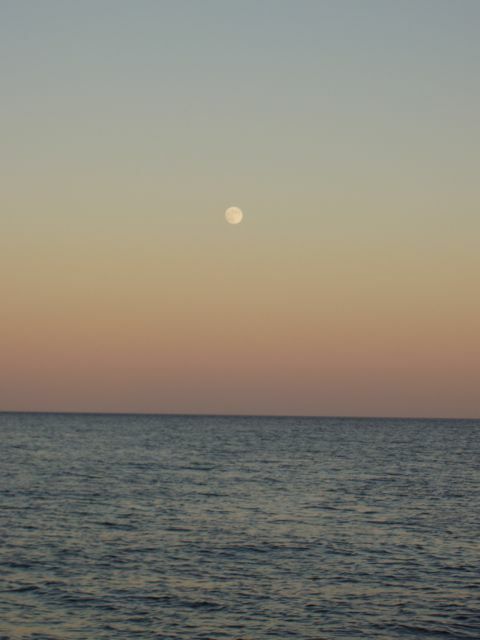 Moonrise over Bahia San Francisquito. Note the dust layer in the air just above the sea surface. After three days of high winds, it's no wonder. 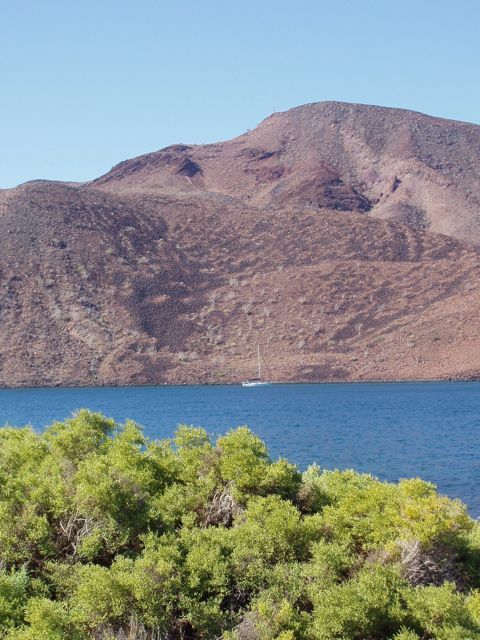 Isla Lorenzo in the distance from our little anchorage in Bahia San Francisquito. There's a lot of dust in the air. 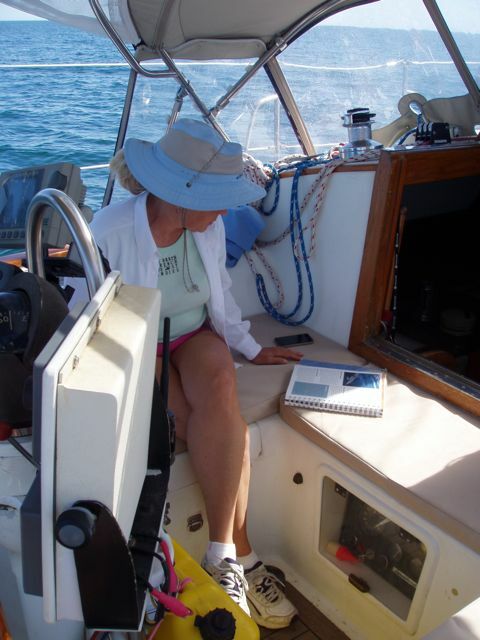 Lovely Conni reads charts and makes plans on the way to Santa Rosalia. Cool ledges along the coast, just north of Santa Rosalia. All of this land is near the Tres Virgines, or "three virgins", a set of volcanoes, so this is volcanic layering. 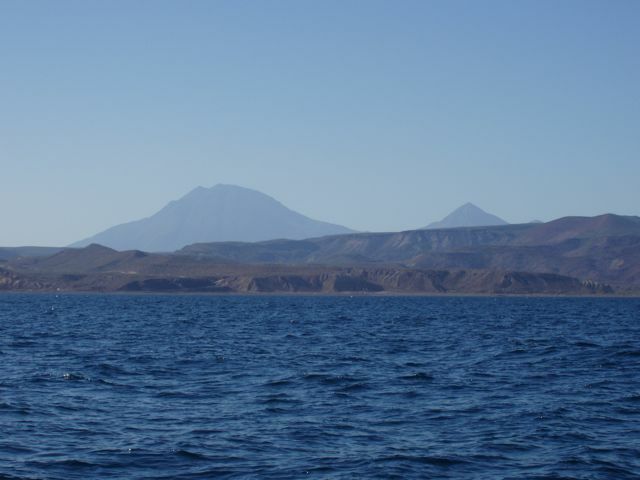 Two of the three "Tres Virgines", a set of stratovolcanos (tall, conical volcanos built up by many layers (strata) of hardened lava, tephra, pumice, and volcanic ash) that line the Baja coast. There are enormous gypsum mines based here.